If you invest in the newest, top of the line air conditioning system, but fail to have a thorough test conducted on your home, the unit won’t perform to the best of its ability. Every home is unique and needs a certain AC size and model to match its space. If you have a licensed professional install your air conditioner, they can conduct an HVAC load calculation before they install the unit to determine if where and how the unit you’ve purchased is installed. There are many factors that contribute to this calculation, such as sun exposure, insulation, the tightness of doors and windows, the number of windows, how many people occupy your home, the house size, the height of ceilings, and what region you live in. Florida is an area where it’s hot for a substantial period throughout the year. Do yourself a favor and have an expert assess your situation before installment. If your new air conditioning system is incorrectly installed, it won’t perform well. Leaky ducts and poor airflow are common consequences of improper installment. Inefficient airflow will prompt you to run your AC at lower temperatures or for longer than necessary to sustain satisfactory cooling levels. Another side effect of a poor installment is an inadequate refrigerant charge. If you cut corners on installation, you’ll often find that your refrigerant levels are below the manufacturer specifications. This impedes the efficiency of your AC because refrigerant levels at an inadequate charge don’t allow the indoor coil to absorb the right amount of heat. This can also damage the compressor because the compressor and the refrigerant charge work together. If the refrigerant levels aren’t right, then the compressor overworks itself causing unneeded wear on the system. Air conditioning systems can be expensive, and it’s tempting to want to cut corners with installation prices. This temptation amplifies when you’re purchasing a new, quality system: you might think it will perform flawlessly regardless of the installation process. Don’t make this mistake. Your air conditioning system functions like an ecosystem. Its various parts all need equal amounts of care. 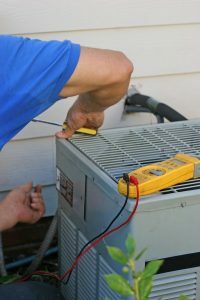 Our technicians know how to set up, install, and maintain your AC system so you get the best air conditioning possible. For a top of the line installment, schedule an appointment with The A/C Guy of Tampa Bay Inc. today.